I’ve been a fan of Marco Paoluzzo’s photography since I discovered his “Iceland” book a few years ago. I was very impressed by his uncompromising monochrome approach to exploring the icelandic landscape, and his skill in conveying the feel not just of the landscape, but also the people who inhabit it and contribute to shaping it. I found his style very different both from anglophile, Velvia school as well as the more austere and formal Germanic style. As demonstrated through his wide range of works, and especially the wonderfully melancholic “America Blues”, It is perhaps more accurate to describe Marco Paoluzzo as a travel photographer than “just” a landscapist, and this shows through in the way he has of conveying a sense of place rather than abstracting from the landscape.“Iceland” was followed up a few years later by “North”, which in fact focussed mainly on Iceland itself, but offered a fleeting glimpse of another old North Atlantic Viking dominion, the Faroe Islands. 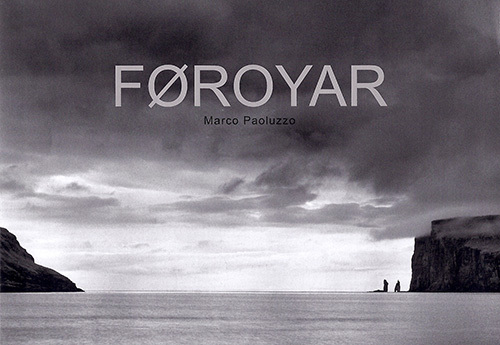 Now, with his new book “Føroyar”, Paoluzzo gives center stage to these islands. Føroyar actually reprises most of the Faroes section of “North”, within a collection of 72 photographs of windswept, often fogbound scenes of a land at the edge of the world. Although Paoluzzo favours dark, one could almost say dismal, tones in his landscapes, nevertheless they radiate light, sometimes soft, sometimes brighter, always hinting at something slightly lost, slightly mysterious. The landscape work tends perhaps less towards the abstract than in “North” and “Iceland”, but nevertheless there are some wonderful studies of form and movement. To my mind this book seems to be the work of someone exploring his inner landscape as much as the external world, blending in a touch of a reportage perspective. It comes as a shock when the sequence of desolate cliffs and mountains descending sharply into the sea is broken up by an overhead shot of a road - a real road, with cars, snaking along a narrow strip between steep slope or sea. Other photographs remind that this is actually an inhabited landscape, sometimes obviously, sometimes more discretely. One wonderful shot shows the bows a ridiculously large cruise liner barely distinguishable just off a fogbound port. Such a ship must be completely out of place in these settings, but finally the fog reclaims it and it just becomes another angular bulk looming up out of nowhere. But finally, these departures from the “classic landscape” repertoire do not detract at all from the collection. They give it an extra dimension and that sense of place which is often lacking in more formal works. You can order the book (with text in English, German and French) directly from Marco Paoluzzo. A French edition has also been published, and can be ordered from Amazon. You can also see a wide selection of Marco’s photography on Flickr.